PLUS I’ll show you how to successfully publish your book via #7 Pathways. I will guide you step by step through interactive hands-on activities. WRITE – Unforgettable Characters and a page-turning Story. PLAN – How to plan your Story step by step. PITCH – How to write a POWERFUL Pitch. PUBLISH – How to Publish via #7 pathways including how to WIN a Grant. She is the award-winning author of 11 empowering books. She won 3 awards, 4 literary grants, 3 sponsorships and a mentorship through the Society of Editors (QLD). She won an Arts Queensland Grant. Check out her published 6 children’s novels, 3 in the Song Bird Superhero series, plus STOP the Bully, Super Space Kids series winning endorsements and *5 STAR reviews. 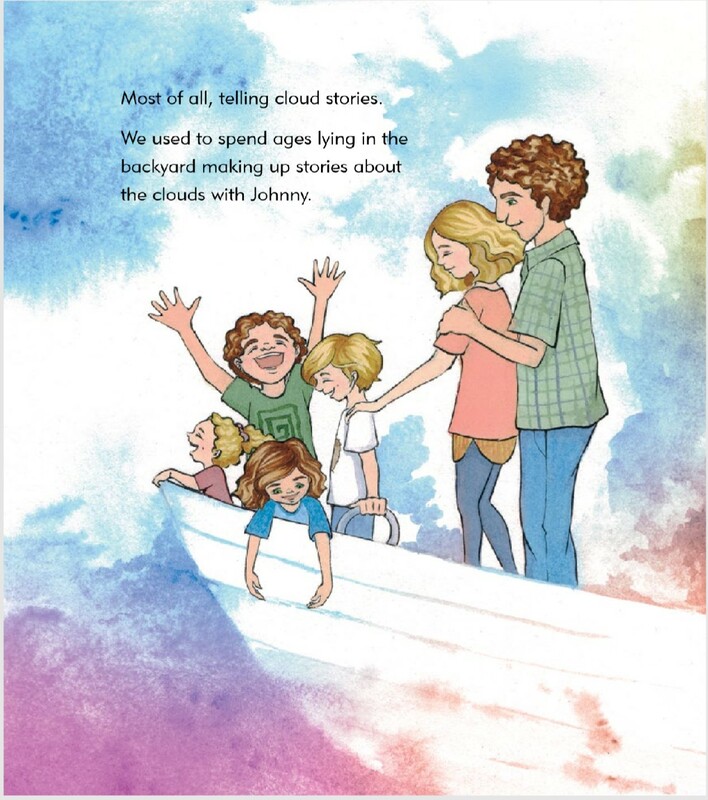 Check out Karen’s picture books, Bailey Beats the Blah, Harry Helps Grandpa Remember, Ready Set Discover Logan two of which won government grants. 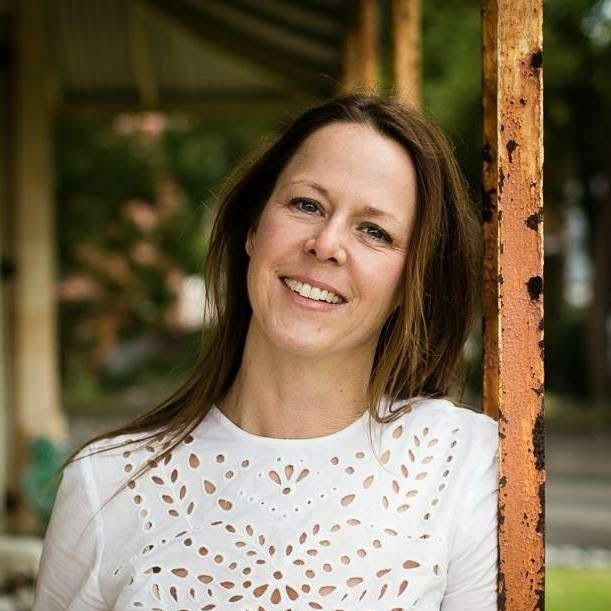 Karen’s an experienced Brisbane school teacher, gifted & talented teacher and motivational speaker. Karen spoke as a key note speaker at Brisbane Convention Centre, teacher’s conferences and in corporate workplaces. She’s listed with 3 speaker agencies. HALF DAY Masterclass includes morning tea & lunch. Topics include: HOW to write unforgettable characters, a page-turning story to hook in the reader, win grants, plan your story, write a powerful pitch and MORE. 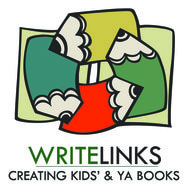 Maximize your chances to Write & Publish a Children’s book! That’s right, you’ll learn writing and publishing strategies in a step by step guide. I’ll teach you how to write, plan, pitch and publish your children’s book to the WORLD. INCLUDES: Half Day Masterclass includes morning tea and lunch. Yummy morning tea and lunch. TOP book writing, planning, pitching and publishing strategies. Interactive networking and brainstorming in-roads. Can you please share with your friends and colleagues? 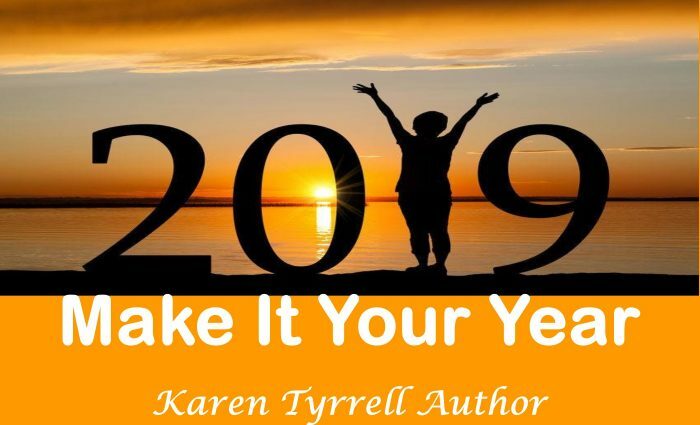 As an award-winning empowerment author, writing workshop presenter and speaker (Karen Tyrrell) I’m aiming HIGH determined to attain my goals and dreams! My passions for writing, speaking and empowerment will drive me in 2019. I’m creating my own luck and capitalizing on every opportunity. With determination, I’m planning ahead every step of the way, setting realistic, achievable goals. I’m focusing on my achievable goals. I’m planning the practical steps to reach there. It’s time to reset my targets, as the New Year comes hurtling towards me. My wish is to make 2019 my MOST memorable year yet, one to be proud of. ASK Yourself: What’s your Main Goal in 2019 Make it Your Year? Squeeze your eyes shut and visualize your Big Picture for 2019. Which goal drives you the most? What do you want to achieve ABOVE everything else? Now set practical mini-goals you can complete in three months or less. Your brain will react to genuine personal goals that are S.M.A.R.T. Specific, Measurable, Attainable, Relevant and Time-Specific. Display your goals at eye level as a constant reminder and incentive. 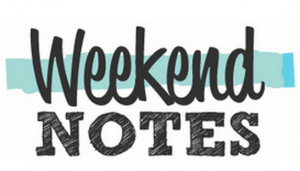 Show on a whiteboard or vision board above your computer … and/or on your fridge. Write every single day with passion and conviction and everything else will follow. 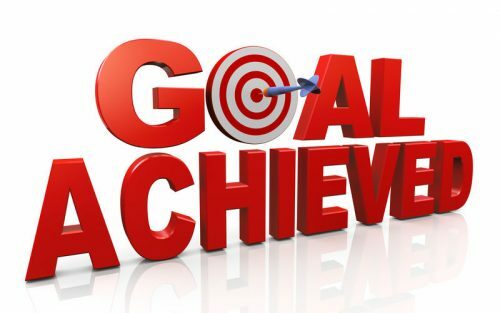 Tick off daily attainable goals in your diary and congratulate myself on every SUCCESS along the way. Rewrite & Redraft every writing project you’ve created to the HIGHEST publishing standard possible. Send away completed projects to writing buddies for feedback, writing competitions, Beta readers or editors. Follow up on VIP emails … Take advantage of every constructive opportunity presented to you. Extend your writers platform, reaching out to your community: face-to-face and via social media. RESEARCH … RESEARCH … RESEARCH every writing project, every opportunity that ignites your interest. Understand how the publishing industry works from the inside out. Join a pro-active writing group or sign up to a writing course that will assist you to achieve your goals. Network and Critique with writers who have a similar passion to you. Create pro-active partnerships. Be creative … envisage a brand-new project that excites you. So, I’m setting those positive goals in motion RIGHT now. Once I was a bullied school teacher… Parents at my school harassed me to breaking point, triggering PTSD within me. Now I’m an award-winning author of #11 books. I won 3 awards, 4 grants, 3 sponsorships and a mentorship from the Society of Editors. 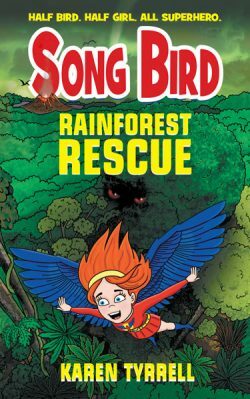 Song Bird Superhero, The Battle of Bug World (Song Bird 2), Rainforest Rescue. 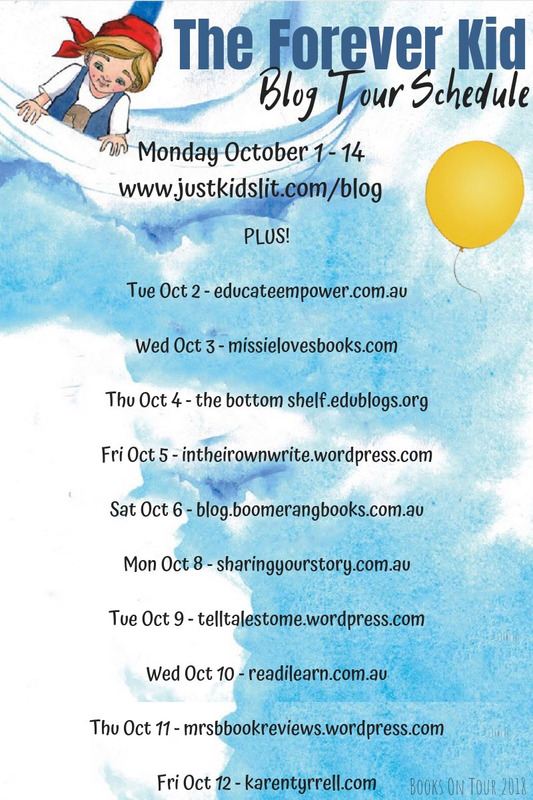 Launch that same book in a Book Tour all over Queensland in schools, libraries and festivals. Share my books to a wider audience including MORE author events, MORE schools, MORE libraries, MORE bookshops and MORE networks. Maintain my OPTIMUM happiness, health and life balance. This MUST be my over-riding #1 PRIORITY. 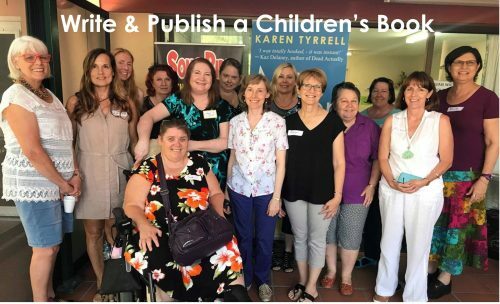 Mentor writers to achieve their writing and publishing goals through my Write and Publish a Children’s Book Masterclass. 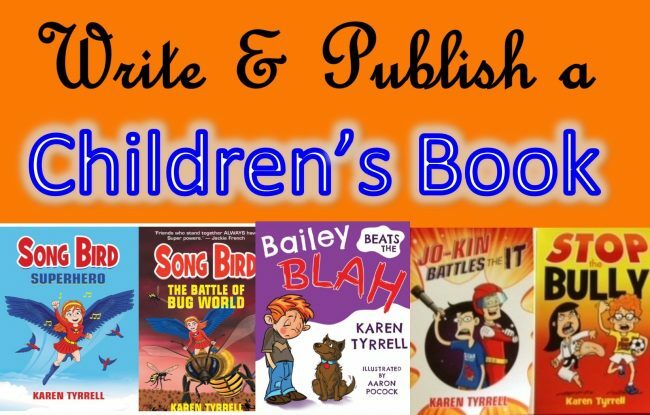 Write, plan, pitch and publish your children’s book. I share #7 ways to Publish a Book. Half Day Masterclass on 19 January, 2018… 9.30-1.00 PM. Wishing you all a VERY happy, healthy and SUCCESSFUL 2019! 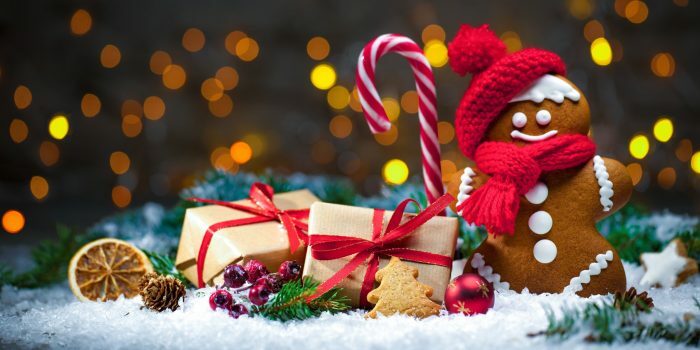 Thanks for your AMAZING friendship, support and encouragement in 2018. What’s your plans for 2019… your year of success? 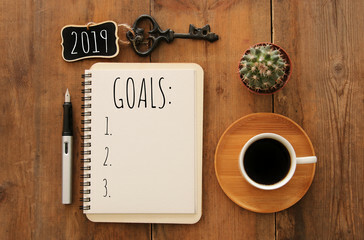 What’s your S.M.A.R.T Goals for 2019? 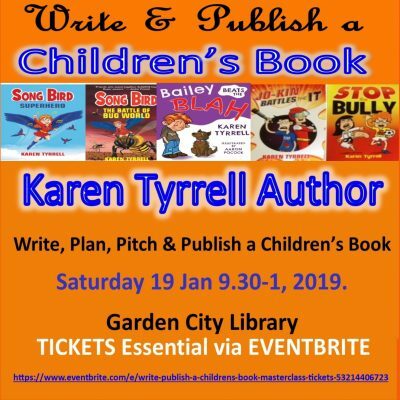 Karen will guide you on how to plan, write, pitch and publish a children’s book. She’ll show you how to create unforgettable characters. And a page-turning story that hooks in your reader. As a bonus, Karen will guide you on #7 ways to publish. She’ll share tips for winning grants and becoming an author-preneur. Karen won 3 awards, 4 literary grants, 3 sponsorships and a mentorship through the Society of Editors (QLD). 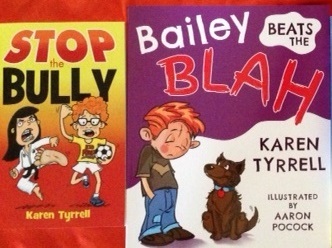 Check out Karen’s picture books, Bailey Beats the Blah, Harry Helps Grandpa Remember, Ready Set Discover Logan. Two of which won government grants. 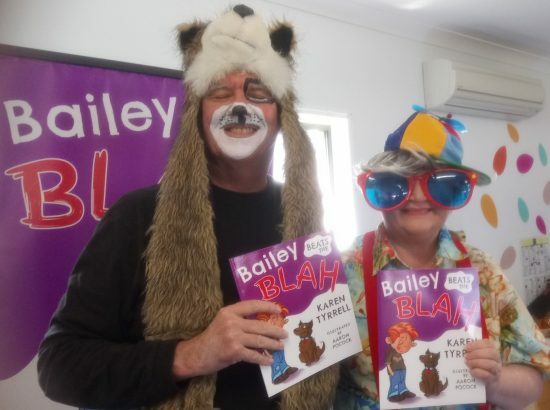 Bailey Beats the Blah is endorsed by Kids Helpline. 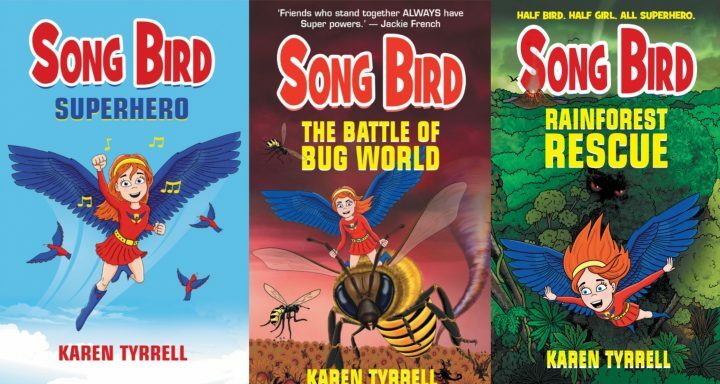 Karen published 6 children’s novels, 3 books in the Song Bird Superhero series, STOP the Bully, 2 books in Super Space Kids series . She won endorsements and *5 STAR reviews. 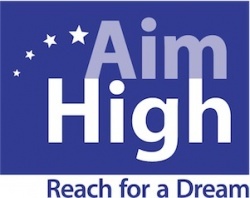 She’s an experienced Brisbane school teacher, gifted & talented teacher and motivational speaker. Recently, Karen spoke as a key note speaker at Brisbane Convention Centre, at A writers festival, a teacher’s conference and in corporate workplaces. She’s listed with 3 speaker agencies. Karen presented Writing Workshops for ALEA Meanjin Writing Camps, Brisbane City Libraries, Queensland Writing Centre . Plus she presented events at Moreton Libraries, Writers Festivals, bookshops, schools and libraries. Who’s kickstarting their writing and publishing in 2019? 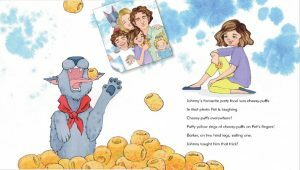 Who wants to Write & Publish a children’s book? Meet Karen as she signs her empowering eco children’s books at Annie’s Books On Peregian, Peregian Beach, Sunshine Coast on 16th December. Which Books at Christmas Book Signing Author Karen Tyrrell? 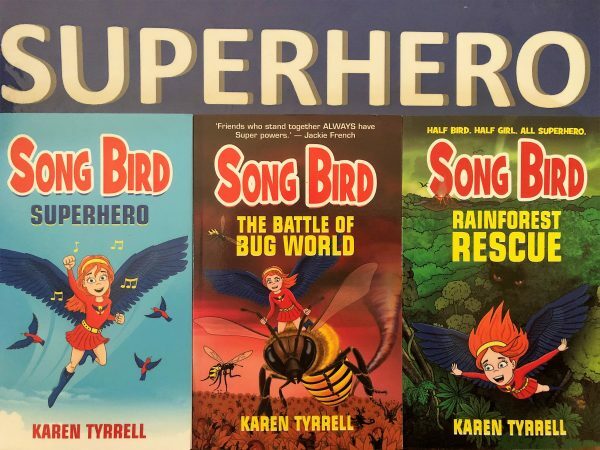 Karen’s acclaimed books include the Song Bird series Song Bird Superhero, The Battle of Bug World and Rainforest Rescue. Grab your FREE Rainforest showbag with the purchase of Rainforest Rescue. Courtesy of Queensland National Parks. 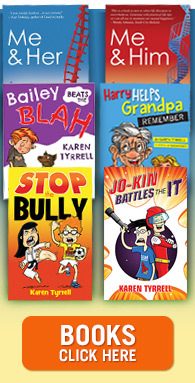 Kids Helpline support Karen’s books STOP the Bully and Bailey Beats the Blah with positive messages on bully prevention and living strong. Alzheimer’s Australia & the Queensland Government support Karen’s picture book Harry Help Grandpa Remember, which won a grant. 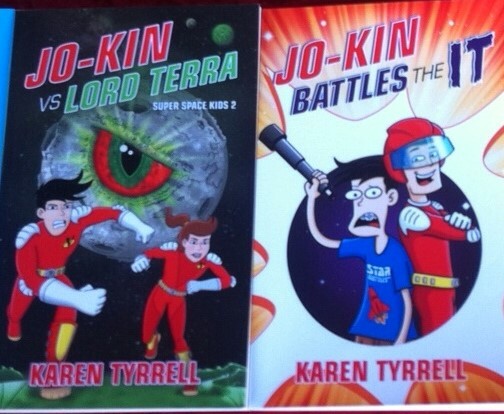 The Super Space Kids Series (Jo-Kin Battles the It and Jo-Kin vs Lord Terra) teaches kids perseverance, STEM science, astronomy and working as a team through humour. 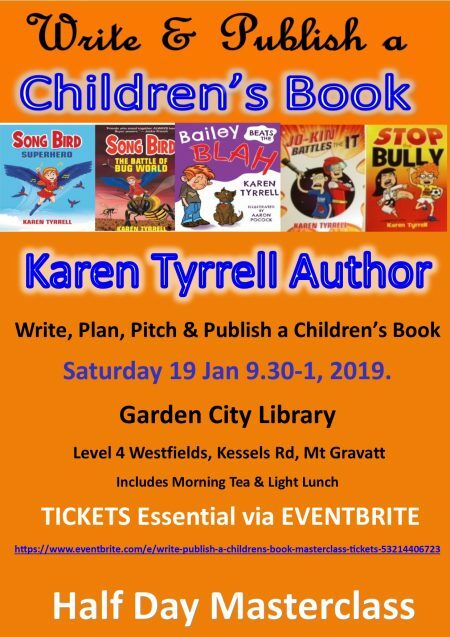 Who’s joining the FUN at Christmas Book Signing Author Karen Tyrrell? 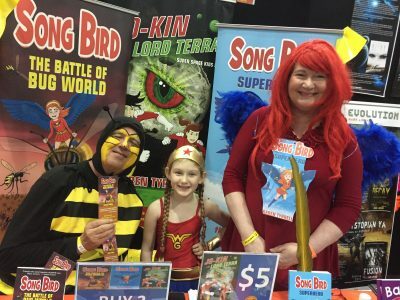 Supanova Brisbane 2018 will host my Superhero Books for Kids at booth #26. I’m thrilled that superheroes, cosplayers and kids will drop by! 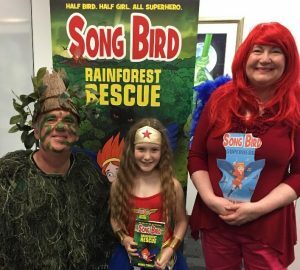 Supanova Brisbane 2018 Superhero Books for Kids will feature my latest novel ‘Rainforest Rescue – Song Bird. 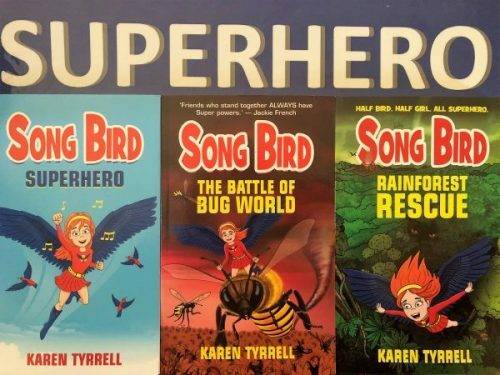 In fact, all my FUN Superhero Books for Kids will be available including Song Bird Superhero, The Battle of Bug World, Rainforest Rescue from my Song Bird series and books from my Super Space Kids series. I will sign copies of Song Bird at my special exhibitor stand in Artists Alley. 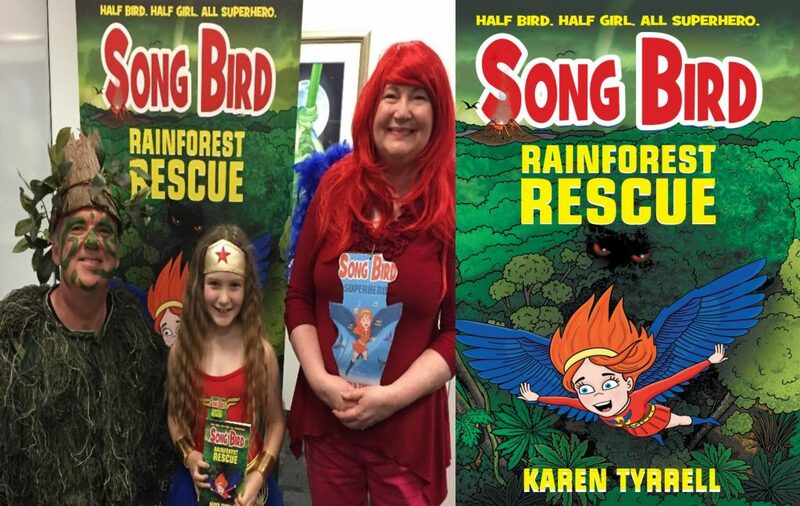 I, Karen Tyrrell will be dressed in my complete Song Bird costume: blue feathery wings, red wig, red boots and all. Recently, I made several guest appearances with guest author Tree Man- Steve Tyrrell. 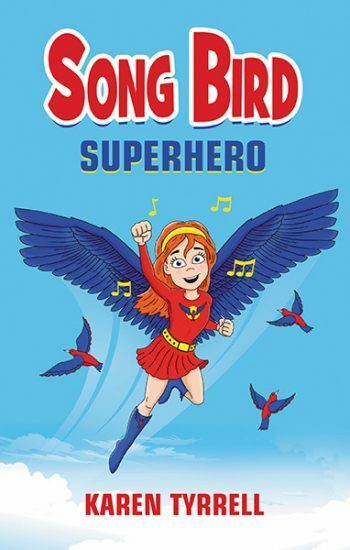 Song Bird gets her superhero powers from singing, science and self-belief. 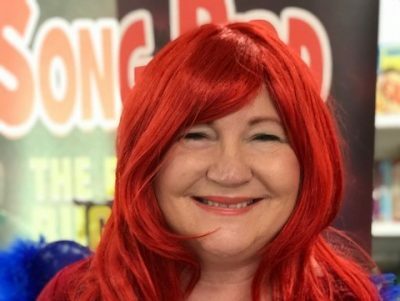 What’s my Supanova Brisbane 2018 Superhero books about? Geeky Josh Atkins (code-name Jo-Kin) wins an online competition to become a Super Space Kid. The It kidnaps Captain Astra, threatening to destroy the Earth. Who will rescue her and save the galaxy? 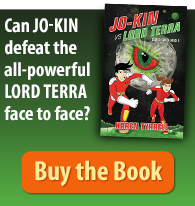 Reluctant hero, Jo-Kin never wanted to be a Super Space Kid, until Lord Terra kidnaps his Commander’s little sister and starts destroying the galaxy. Can Jo-Kin defeat the all-powerful Lord Terra face to face? What’s on at Supanova Brisbane 2018? You’ve seen the shows, now meet the stars! Supanova Comic Con & Gaming is Australia’s biggest pop culture convention, showcasing the very best in film, television, comic books, video games and more! The weekend-long event offers a perfect day out for families, with all-ages entertainment in the form of ‘cosplay’ (costume-role play), fan clubs, musical performances, creative master classes, wrestling, tournaments, competitions, celebrity Q&A panels, and an exhibition hall full of shopping possibilities. 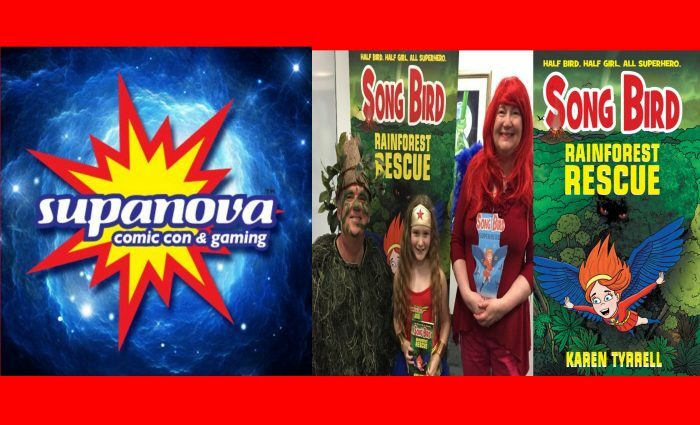 Supanova is a fun filled event for all ages! Kids 12 and under are free with any paying adult! Buy Rainforest Rescue … you get a FREE Rainforest Show bag. 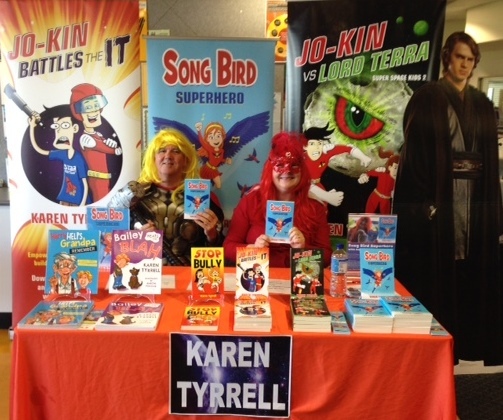 FIND: Superhero Books for Kids AKA Karen & Steve Tyrrell at Booth #26. Who’s going to Supanova Brisbane 2018? Who else has a booth? 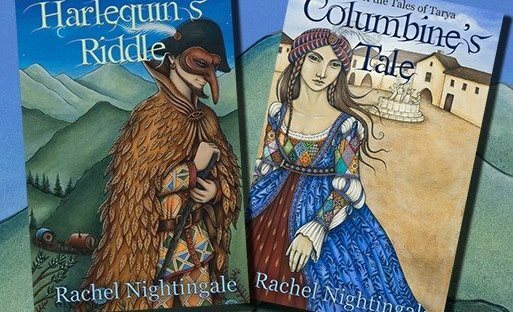 Columbines Tale (The Tales of Tarya #2) by Rachel Nightingale. Its published by Odyssey Books. 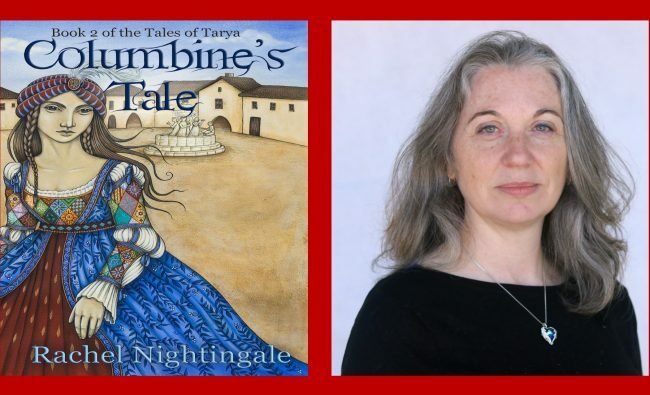 Meet Rachel Nightingale, author of Columbines Tale and The Tales of Tarya series. Rachel Nightingale is a writer, playwright, educator and actor. 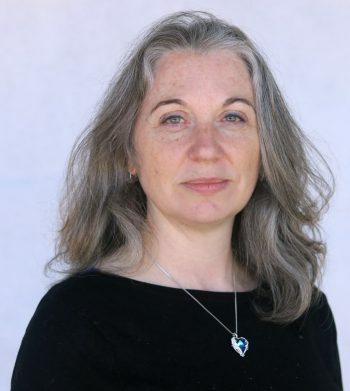 With a passion for storytelling and the theatre, her first fantasy series centres on both. For three hundred years the travelling actors of Litonya roamed the land entertaining crowds. But secretly leaving devastation in their wake. Is Mina the only person with the magical power to stop them? In the ethereal otherworld of Tarya, Mina begins to master the rare, inexplicable powers attached to her gift for storytelling. She discovers she can touch dreams, influence the real world, and perhaps find out who is manipulating Tarya for dark purposes. In the waking world Mina is on the run, beset by divided loyalties between the travellers. She’s caught between two men she could love, and a brother who desperately needs her help. 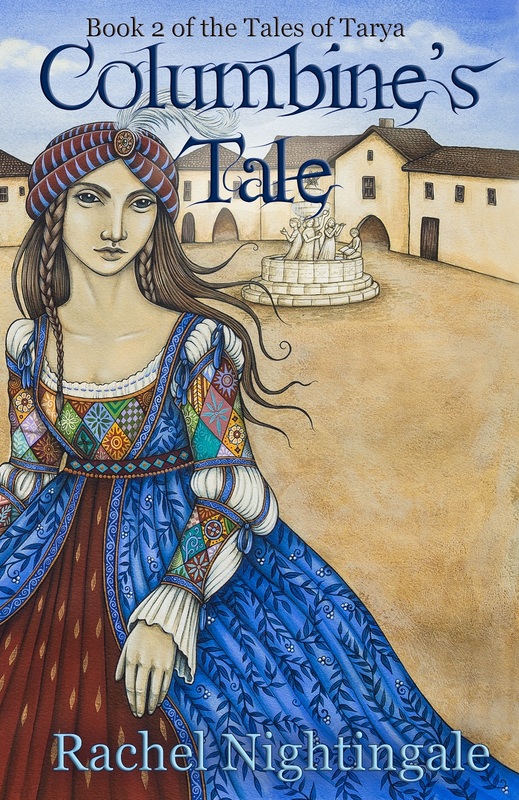 Columbines Tale is book 2 of the Tales of Tarya series. 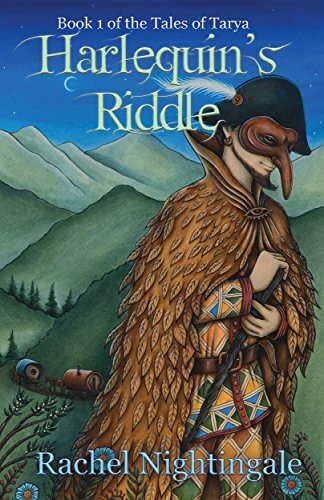 In 20 words can you explain what happened in book 1, Harlequin’s Riddle? When Mina discovered the secret behind the performances of the travelling players, she found herself in a lot of danger. How did you to develop Mina’s story in book 2? In the second book Mina is still looking for her missing brother, but she is also driven by a need to undo the damage done by at least one of the travelling players. She needs to work out the best way to do this, but this leads her to even more hidden secrets about the world of artisans. How did you plan your entire book series so you would have enough content for a series? At the heart of the series is a mystery – who is doing terrible things in the name of art, and why? Mina is basically uncovering the clues to answer those questions, one piece at a time. She can only find out new pieces of the puzzle as she gets better at travelling in Tarya and understanding what she is seeing. To do that, she has to develop her own gifts as a storyteller. All of that takes time. In planning the series, I had to work backwards – I had to know what’s really going on. Then I worked out what to reveal when, and fit that in with Mina’s journey. And of course, Mina’s growing up and travelling for the first time. So there are other discoveries too, including romance. How do you keep tabs on your character traits, and details of the settings so they remain consistent through the whole book series? I have a fairly big word document that I’ve set up with headings so I can jump to the right section straight away. 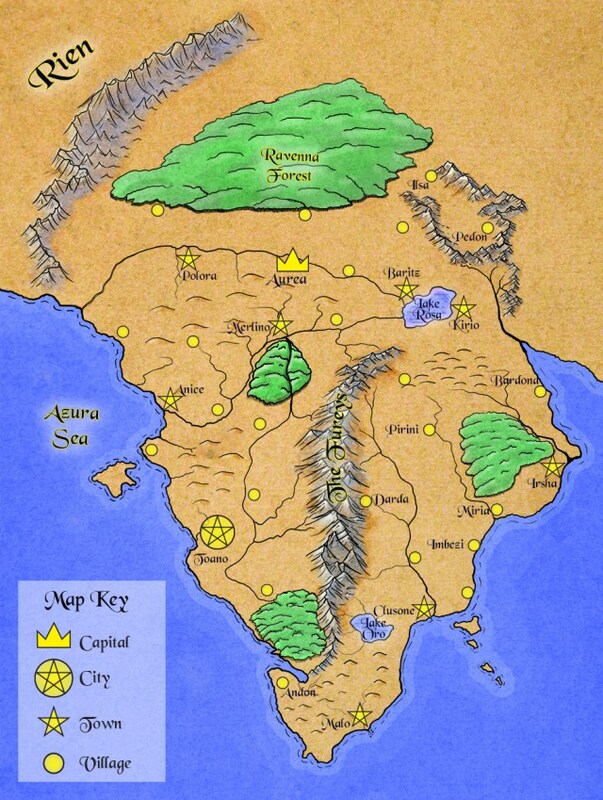 That sets out all my characters, relevant history, physical places, and places within Tarya as well. Writing a story over three books, continuity is so important, so I’m constantly going back and double-checking what something looks like, or what powers are possible in different parts of Tarya. If I think I can hold it all in my head, I’m going to get something wrong, like when Nadia (the cover artist) checked Mina’s eye colour with me for the second cover and I gave her Miranda’s eye colour instead! Luckily a dash of paint and it was easily fixed! 5. Can you please share 5 tips on how to write an intriguing book series? If you’re writing a story over several books you definitely need to plot. Don’t fly by the seat of your pants. If you plan it all out, you can put little clues into the first book that will only make sense once the mystery is solved in the final book. That’s the sort of thing I find intriguing. Having interesting characters who grow and change will also help – otherwise people will get bored with following their adventures, no matter how exciting the events. I think posing questions and not answering them straight away is good – it keeps people curious. Is Mina ever going to find her brother? Who tried to kill her? Knowing how to pace the story is also important. With three books you can include a lot more, but you don’t want it to drag, so you need to keep it moving. Okay, that’s four! Make the relationships interesting I’m already getting feedback after the second book about Mina’s connection with a couple of different characters, and what’s going to happen there, but I can’t say anything more because… spoilers! 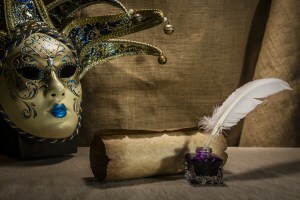 Old inkstand with feather near scroll and Venezian mask on canvas background. Win a FREE ebook of Columbine’s Tale by leaving a comment below on why you want to win a copy. 2 FREE copies to be won. This is a game of skill not chance. Competition open to anyone around the world. Winners announced next Friday 2 Nov 5 pm. 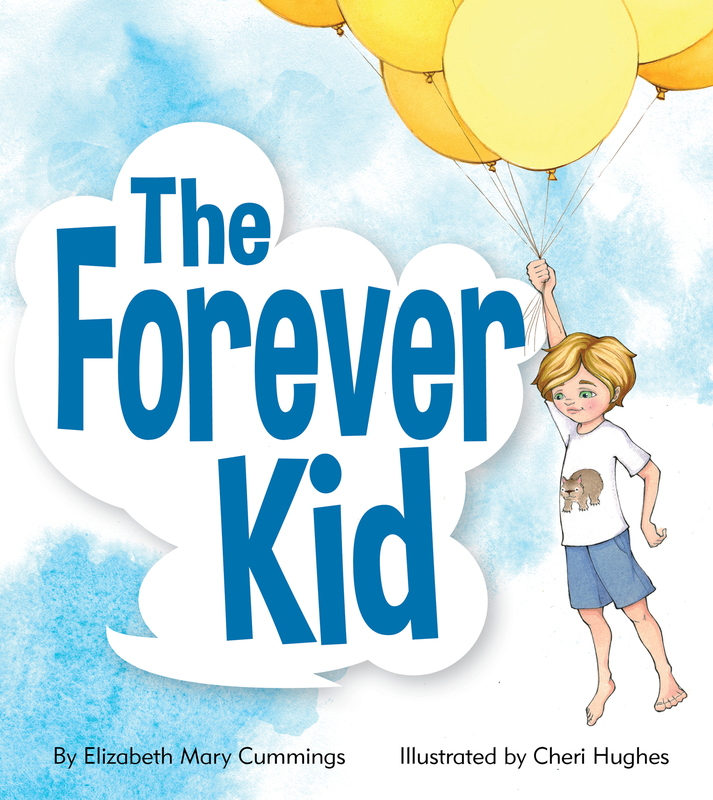 The Forever Kid by Elizabeth Mary Cummings … Illustrated by Cheri Hughes. Published by Big Sky Publishing. 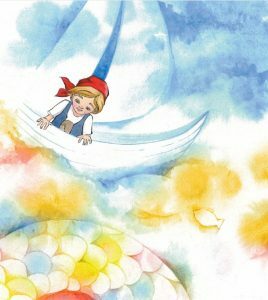 Picture book for kids 4-8. Johnny is The Forever Kid and he’s celebrating his birthday. Only problem is, he’s passed away. His family still gather and lovingly celebrate his birthday. They continue Johnny’s favourite party traditions by sharing very special memories of him. They experience a sense of closeness and comfort on his special day of remembrance. Johnny will forever be The Forever Kid in their hearts and memories. 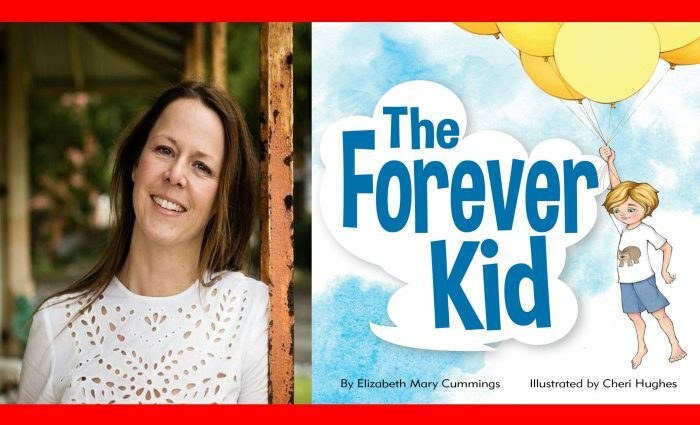 Elizabeth’s picture book gently tackles how children can deal with grief. I love the quote below on how she wrote this book. Cheri Hughes illustrates the book beautifully, sensitively … and tenderly. Grief, memories, loss, family love, resilience, traditions, hope. 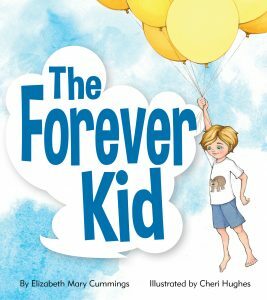 The Forever Kid is for children, especially those who are dealing with grief over the loss of a loved-one or sibling. 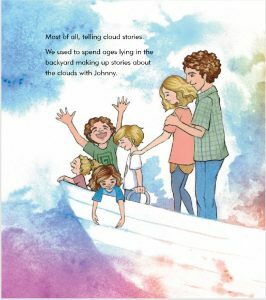 Perfect for families, teachers, social workers and counselors to gently open up discussion and feelings on grief and loss. The book is part of a Books on Tour. Check out reviews, blogs and interviews below on websites. I’m giving away a free copy!! So, please leave a comment below for an opportunity to win. Competition is based on skill, not chance, so leave your best comment on why you want to win. Australia Only. The winner will be announced next Friday 19th October 5pm. Why do you want to win a free copy? 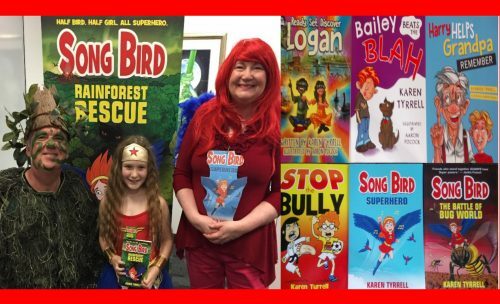 Who would believe that bullying, child empowerment and self-belief would inspire me to write my Song Bird book series? How? In grade six, a frenemy (half friend-half enemy) bullied me continuously, eroding away my self-confidence. I found solace by singing in the school choir and becoming a science nerd, empowering me to believe in myself and ignore the bullying. 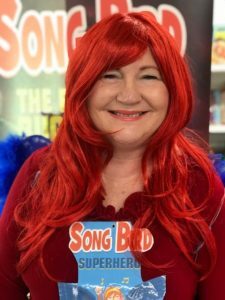 These personal experiences inspired me to create Song Bird Superhero (Book 1) and my favourite character, Rosella Ava Bird aka Rosie. 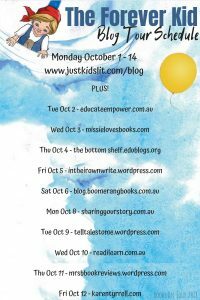 Once Rosie found her empowerment, she formed a dynamic trio with friends Amy Hillcrest, a disabled girl in a wheelchair … and stuttering, geeky school captain Ben. All three kids love Maths, Science, Engineering and Technology – STEM. Together, they support each other and fight bullies and save the bullied and the school. 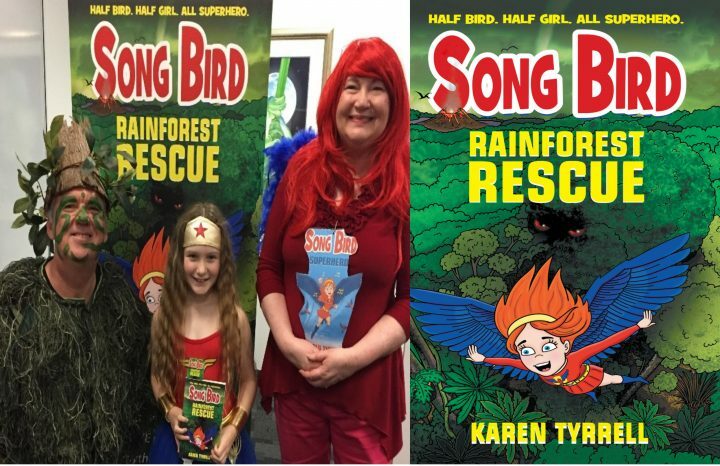 Song Bird Superhero became a success with young readers, and they implored me to write the next adventure in the book series. I made Rosie an environmental superhero, an eco-warrior. She found that if she can stop the bully, Frank her next-door neighbour, she can do anything. She believes in herself and friends that they can save the environment and stop environmental villain, Destructo. 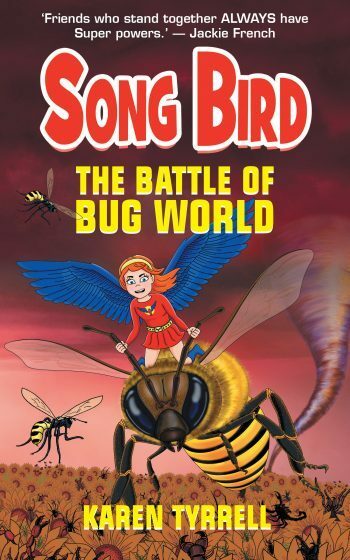 I wrote Song Bird: Battle of Bug World to show kids the effects of climate change and the simple things they can do themselves to save the bees and care for the planet. In Rainforest Rescue, Destructo returns to wreak havoc on the rainforest and the trees. It’s up to Song Bird to solve the secrets about disappearing friends, strange mythical creatures and why the rainforest is dying. 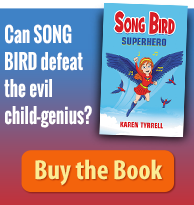 How did I create the Song Bird Book Series? I include eight key characters in every story- friends, family and enemies. For my main character, Rosella Ava Bird (bullied), and her side-kicks Amy Hillcrest (disabled) and Ben (low self-esteem), I have detailed character notes and interviews, keeping tabs on their appearance, description, back story, flaws and favourite expressions. As the series progresses, I give them increasing self-confidence and problem-solving abilities. I do the same for Rosie’s family and class teacher, Miss Darling AKA Wonder Girl but to a lesser degree. I want her character to remain mysterious. 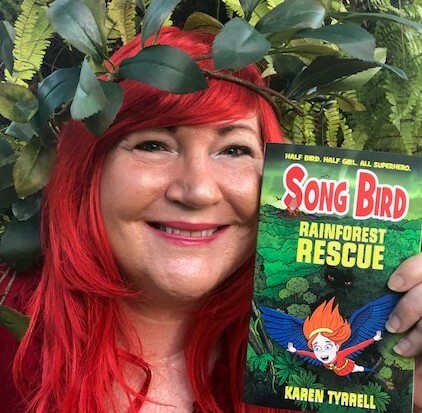 Why did you choose eco themes for the Song Bird book series? As a teacher, environmental issues were part of my class teaching and my personal lifestyle and interest. For twenty years, I have hiked through Gondwana rainforests and national parks in Mt Tamborine, Springbrook and Lamington National Park behind the Gold Coast. I want families to hike in our rainforests and find their own health benefits, It’s the perfect way to de-stress, get fit, and breathe in nature. Write your first book with a series in mind. 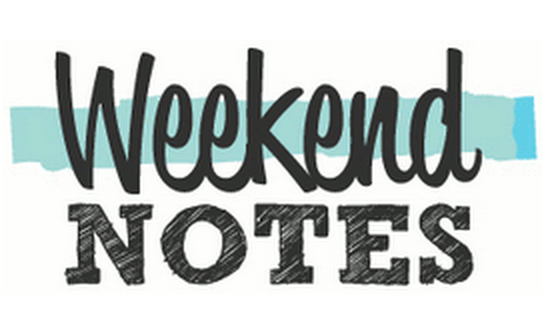 As you write book 1, scribble down ideas for books 2 and 3. Create a series title or make the character’s name the series title e.g. Song Bird, Jo-Kin. Craft your first book with an extremely likeable hero main character, a character who readers will strongly identify with. Create a sidekick and/or a team to fight the bad or evil characters or to fight challenges. Create a strong sense of place with each scene. In book 2, introduce new characters, new challenges and new scenes to keep the story fresh and exciting. Keep track of your characters, their dreams and fears, their description and their character tags. Keep these consistent over your series. What’s the message of Song Bird book series? Children can empower themselves to live stronger, to make a difference in their own lives and in the world around them. I continually preach, take risks, have a go, and never give up. What Book Series tips resonates with you? What writing tips would you like to share? OMG! My heart pounded with both disbelief … and with pride! HOW did Rainforest Rescue #6 BEST New Adventure Book in the World? As featured on CNN, Forbes and Inc – Bookauthority identifies and rates the best books in the world, based on public reviews, recommendations, ratings, mentions and sentiment. What’s Rainforest Rescue #6 BEST New Adventure Book in the World … about? Rainforest Rescue empowers kids to become eco warriors, caring for trees, rainforests and national parks. 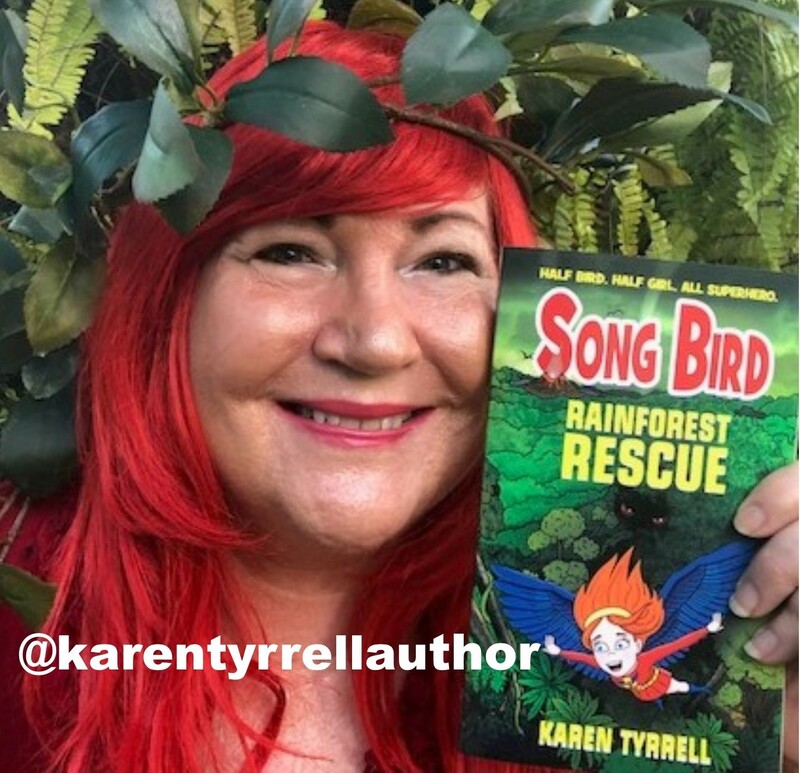 My 9th children’s book, Rainforest Rescue educates kids on indigenous culture, Dreamtime mythical creatures, bush tucker and positive role models. Thanks to Uncle Barry Watson, aboriginal elder for being my cultural supervisor … and Queensland National Parks for being my role model. HALF BIRD. HALF GIRL. ALL SUPERHERO. Song Bird travels to when time began, to battle her enemies. Can Song Bird unlock the secret before the world ends? HUGE thanks to reviewers: Alison Stegert, Georgina Ballantine, Christine Titheridge and Lana James. Special thanks to reviewers: Jacqui Halpin, Kathryn Morgan, Ruth Garlick and Jimboomba. Special thanks to those who reviewed Rainforest Rescue, published my blogs, interviewed me. Thanks to those who wrote their own story based on an interview. Thanks for getting Rainforest Rescue into the Blogosphere!! Magazine, She Society published a story about me. Special thanks to Haven magazine, Tamborine Times, Scenic News, Albert & Logan News and MORE. 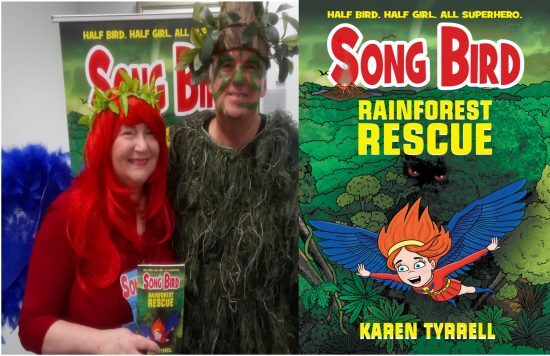 Meet Karen Tyrrell author AKA Song Bird Superhero and Steve Tyrrell AKA Tree Man this week. FREE Rainforest show bag, compliments of Queensland National Parks with every purchase. 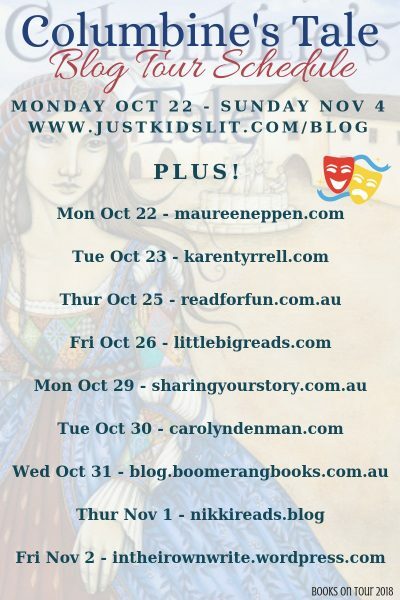 7 SEP 10-1 Big B Bookshop, Big B Arcade, 16/50 James St, Burleigh Heads, Gold Coast. I’ll post you a signed copy of Rainforest Rescue anywhere in Australia. What do you think … Rainforest Rescue #6 BEST New Adventure Book in the World? 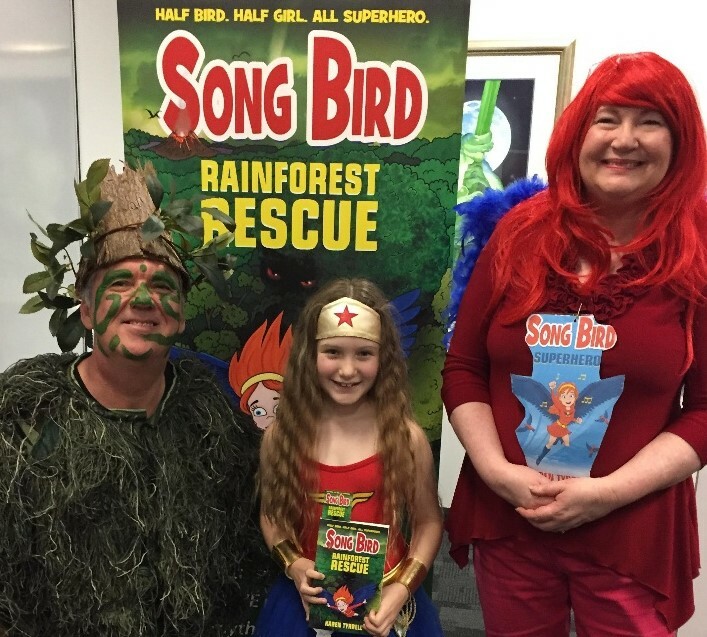 Last Saturday, I launched Rainforest Rescue to a crowd of fans, supporters, friends, family … and little superheroes. ★★★★★ Rainforest Rescue is now available on Amazon as a print and eBook. Order a signed copy. Comes with Rainforest bag courtesy of my sponsor Queensland National Parks. Special deal available anywhere in Australia. Can you please SHARE my incredible NEWS with your friends?